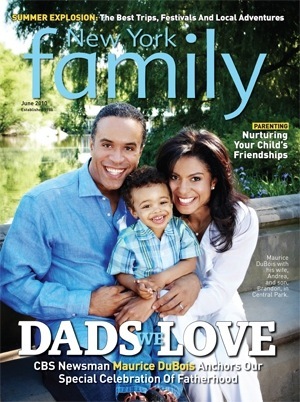 Check out the digital edition of New York Family magazine’s June issue! Channeling Dad: CBS 2 News Anchor Maurice DuBois talks about parenthood, breaking the news and balancing it all. Dads We Love: From a beloved children’s author to the Chairman of the NYC Housing Authority, we celebrate an inspiring group of dads. Big Summer Fun Guide: Our guide to outdoor fun in the city; family-friendly festivals in the Northeast and beyond; tourist attractions for non-tourists; essential summer gear and more. Healthy Dad, Happy Family: Tips for men on curbing stress, exercising with yoga and eating well. Father’s Day Gift Guide: Inspired Father’s Day gift ideas, from gizmos to gadgets to grills. Moving Beyond Mr. Mom: Founded by at-home dad Lance Somerfeld, the NYC Dads Group helps local fathers find something they’ve been sorely missing: each other. Father Figures: An interview with Bruce Feiler, who enlisted six of his friends to serve as dads to hisdaughters when he was diagnosed with cancer. Playing It Safe: Advice from childproofing experts on making your home a haven. Growing Up: Author Elizabeth Hartley-Brewer on the role parents play in nurturing children’s friendships. Adults Only: Journalist and mom Lori Gottlieb examines what’s important in a partner in a controversial new book. Buzzworthy: Organic baby food delivered to your door; chic and summery nursing covers; how to have a successful lemonade stand and more.